Wonder what it’s like to join us in our island paradise? This gorgeous video from talented Feb graduate Samantha Taylor will give you a pretty good idea! From yoga on the beach, dancing with new friends, snorkeling with Manta Rays, exploring pristine tropical islands and everything in between. All while gaining an amazing qualification to change your life and career! Santosha means ‘contentment’ – and we want all our students to have an experience of this feeling, the feeling that all you need is here in this moment. 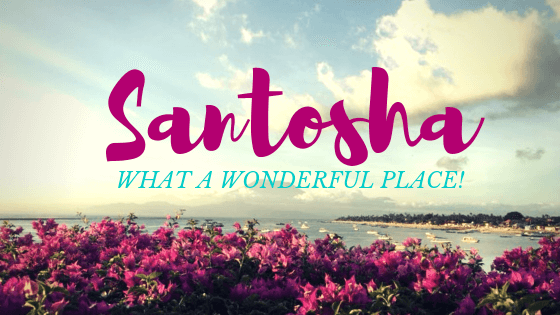 The Sanskrit word Santosha is divided into two parts: san, meaning completely or entirely, and tosha, meaning acceptance, satisfaction, and contentment. Complete acceptance and surrender to what is. We often read and hear people say phrases like “trust in the universe” or “the universe has your back, just let it guide you”. But what does this actually mean? We love seeing our graduates sharing their passion with the world! So we were very excited to see an article in The Oamaru Mail recently, featuring graduate Jae and her studio Bliss Yoga which showcases Jae’s hard work spreading yoga and wellness in the local community. We hope Jae’s story inspires you to start thinking where your Santosha RYT-200 Yoga Teacher Training could take you. From student to studio-owner perhaps! What is a Yoga Teacher Training like? What was it like? An experience like no other. We were so lucky to have talented photographer and blogger Laura Elina join us on our March Level 1 Yoga Teacher Training. On her fantastic blog Nomadic Pages she documented some of her experiences (and AMAZING photos) from the course, which she has kindly allowed us to re-post. Thanks Laura for sharing your beautiful words and pictures with us, they are spellbinding! Ever thought of doing a Yoga Teacher Training? Well, if you would have asked me that question a few years ago, I would have given you the straight, honest answer ‘No’. However, as life happens and brings along changes all the time, yoga became a very significant part of me. Moving to a new city and starting all over again, I knew it was time for me to use this chance and listen to my heart. And I did just that booking myself into a 200 Yoga Teacher Training (YTT) in Bali….